Lord Tennyson got it right. “In springtime, a young man’s fancy turns to thoughts of love.” And we all know what young men (and young women!) love. Beer! 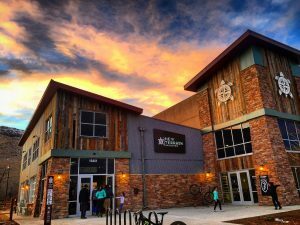 There’s no more exciting time to be in love with beer than springtime in Golden, Colorado when you can stop and smell the hops in six craft breweries. 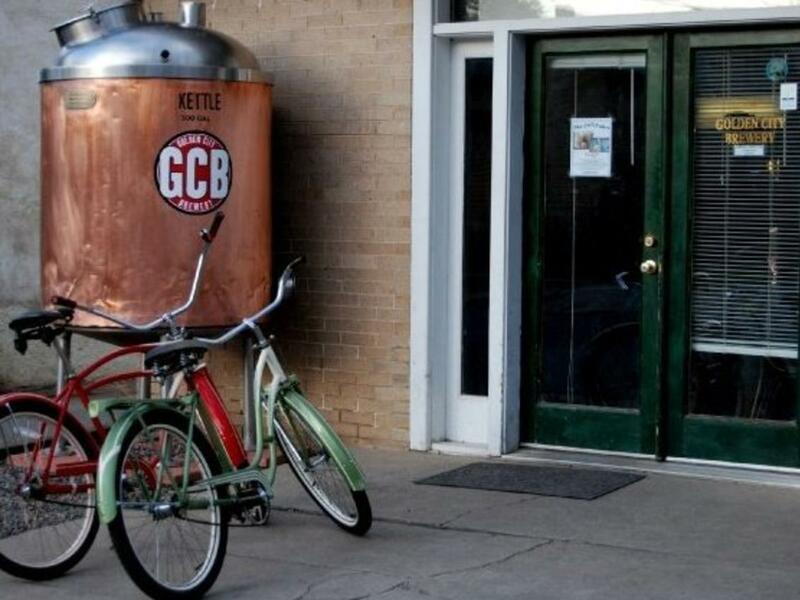 Even better, you can bike between the breweries on the historic backstreets of Golden using the FREE Golden Bike Library. The Golden Bike Library has over 40 bikes available for FREE two-hour rentals every Thurs.-Sun., from 10 a.m to 4 p.m. Located at the Golden Visitors Center at 1010 Washington, people just sign a waiver, present a valid ID and credit card and pedal away. The first two hours are free, a full day rental is only $10. Bikes come with a helmet and lock, a reusable water bottle and a Golden Ticket good for discounts at various local businesses and restaurants. There is a lock-box system so renters can return bikes after 4 p.m. 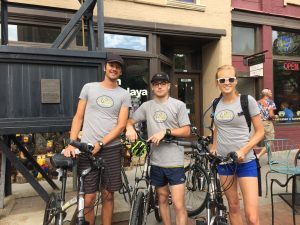 Unlike other bike share programs, Golden’s has a wide selection of different style bikes, including light-weight geared bikes in multiple sizes to either cruise around town, or tackle Golden’s hills, including The Explorer, one of Jamis’ best-selling bikes. Now…where to go? 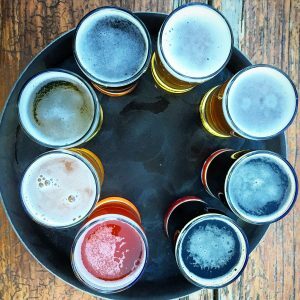 Here are six breweries all within an easy bike ride of each other and some suggested samplings to try at each. It’s only a block to this iconic brewery which has a classic outdoor beer garden with food trucks. Try an Infra-Red IPA. This malty Red IPA has a resiny bitterness, thanks to generous amounts of Simcoe, Northern Brewer, and Chinook hops. Wanderlust is a Belgian Golden Ale with lavender floral notes mixed with hints of sweet pear. Biere de Mars - Literally "Beer of March" is a French ale with subtle notes of honey that tastes even better in April. For a true spring fling, go for the Blueberry Honey Wit - a Belgian Wit brewed with Blueberry Honey and a spring lemon zest. Pedal along the Clear Creek bike path, cross one of the bridges and you’ll soon find yourself in Charlie & Janine Sturdavant’s backyard. The Golden City Brewery is in their house, and you buy the beer from the old garage. There’s outdoor tables, dogs are welcome, and don’t be surprised if there are musicians playing. In honor of the Colorado Rockies opening day, the brewery produces Stand-Up Double IPA. In baseball, a stand-up double is a hit that gets the batter to 2nd base without having to slide. In this case, the stand-up double is a beer that takes you twice as far in hops and strength. Welcome to the all-American sport of hopheads, complete with intensely hoppy, complex flavors and aromas brought home by a smooth, dry finish. Time to work off those calories biking on the new paved off-road bike trail along 44th Ave. You’ll then turn on Salvia Street and head up an unpaved trail that will lead you in through the back of the brewery property. Of course, you’ll want to start your beer tasting with a Cruise Ride, a light body American Style Cream Ale with hints of fruit and a mild biscuit backbone. Smooth and sessionable, all types of beer drinkers will enjoy this. Or go for a Hoppa Tropica, made with 100% Citra Hops to give it tropical aromas and flavors of citrus and mango, a great little Spring Break tropical escape. Have your samplers at the outdoor deck enjoying the views of North and South Table Mountains. The easiest way to Holidaily Brewing (if you have a mountain bike) is right over the top of North Table Mountain. If you’re on street bikes, it’s a nice flat pedal around the mountain to this one-of-a-kind brewery dedicated to making delicious tasting gluten-free beers. Try a Buckwit Belgian, a thirst quenching light brew with a mix of coriander and orange peel. Or let your hair down with a Ponytail Pale Ale – a single hop variety pale ale brewed specially for Collaboration Fest 2017. It’s all downhill to this award-winning brewery that took home two gold medals at the 2016 Great American Beer Festival. On tap in spring is the Rosemary Sourdough Saison, an ale inspired by the perfect loaf of bread. This liquid bread is a loose interpretation of the Saison style brewed with fresh organic Rosemary and features a prominent tartness from the contribution of acidulated malt. The result is a dry, refreshing ale with a delicate yet distinct aroma of fresh Rosemary. Barrels & Bottles Brewery It’s all downhill back to the Golden Bike Library and our last stop, Barrels & Bottles, where you have your choice between two dozen craft beers – or two dozen fine wines. Try the favorite – an Orange Creamsicle Blonde Ale -- an approachable, malt-oriented American beer that is well-balanced with orange peel and juice added along with Madagascar vanilla beans. It&apos;ll bring you back to your childhood from the aroma and flavors. After a long ride, Space Oddity Pale Ale is a thirst quencher displaying earthy, floral and herbal aromas by using an English hop varietal. Medium hop bitterness with a slight malty sweetness. End your day of Colorado biking with an all Colorado ingredient brew -- Colorado BAE India Pale Ale. The Cascade hops used lend aromas of grapefruit, melons with a slight floral tone. Flavors of grapefruit and a touch of spice. The Golden Bike Library is just down the block from your final stop. Of course, these are suggestions only and not intended to be consumed on one trip. Please drink responsibly. We suggest having only a sample and a glass of water at each brewery stop. The Golden Bike Brewery Tour Map will help guide you in planning your route. For more ideas for fun adventures in Golden follow us on Facebook, Instagram and Twitter. 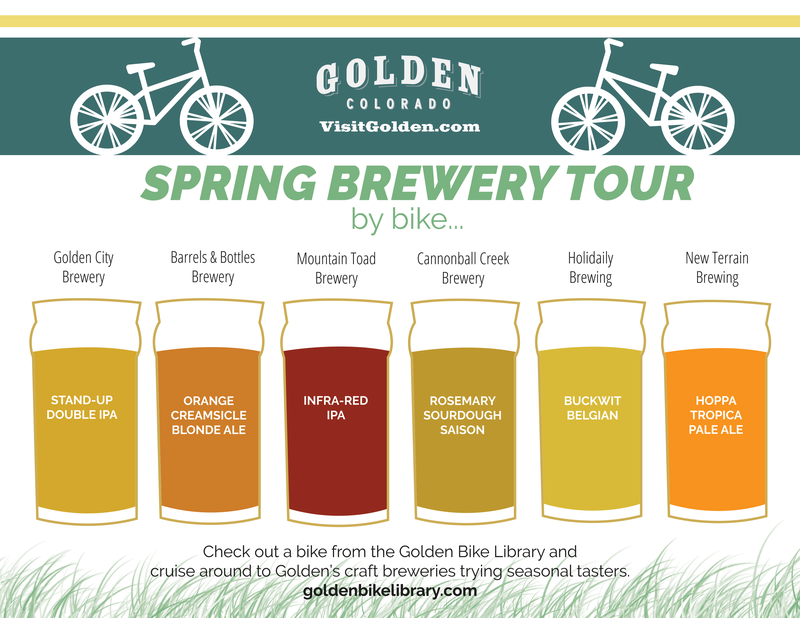 Be sure to tag @visitgoldenco in your bike brewery tour posts and use #GoldenBikeLibrary.